Fist pumps, banter and GAA jerseys. The terrain was a familiar one, though the geography was very different. In Madrid to meet Spanish Prime Minister Mariano Rajoy on the first of the year's many crucial forays into Europe to garner support for Ireland's "special case" status when it comes to all things 'Brexit', Enda fell automatically into election fettle. Not knowing the form, the Spanish shoppers were taken aback by this avuncular figure parading around Primark's gigantic flagship Spanish store. The spectacular 1920s building is located on Calle Gran Via and operated from the Dublin headquarters. Penneys has become hot property there, outselling all the other traditional Spanish big names. 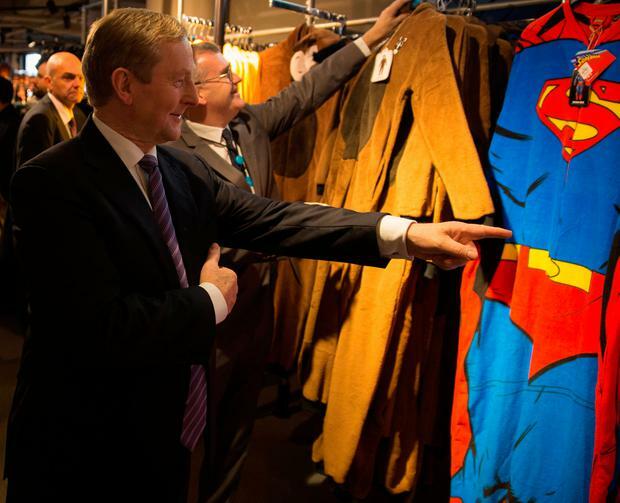 Enda marvelled at adult onesie, one a cosy-fleeced horse costume, the other Superman outfit. The onesie trend is just taking off in Spain, he was informed by Stephen Mullen, head of Primark's retail operations in Iberia. Enda picked up a wellington boot for closer examination and remarked at the €1.50 price tag on a range of T-shirts. "Well, that's the end of a line thing," Stephen explained. A shop worker, who had previously been peacefully folding T-shirts, was left shaking like a leaf as she was pounced on before a flank of cameras and officials. Peak election mode came as Enda walked into the swanky glass-doored office of a startled Primark staff member, gate-crashing her Skype call with Brian from Barefield in Ennis, Co Clare, - who was working in the Dublin HR department. Enda came armed with a GAA jersey, or at least a Galician one - presented to Mr Rajoy, personalised with his name on the back. Gaelic football has really taken off in Galicia because of the Celtic connections, with many actual Galicians rather than Irish ex-pats taking it up, explained a staff member from the Spanish embassy. But at the back of all the plamás-ing lay serious business. During a 30-minute meeting, they discussed the strong tourism ties - with 1.7 m Irish people visiting Spain in 2016, while 400,000 Spanish people visited Ireland. They agreed on the major threats of jihad, counter-terrorism and gangland crime - with closer ties being forged between the Gardaí and their Spanish counterparts to fight it. Mr Rajoy pledged there would be "no impunity" for gangs. But, mostly, they talked Brexit. With too little known about what the UK intends to seek when it triggers Article 50 at the end of March, discussions between the two premiers could only really constitute the start of a very long process. Mr Rahoy said our two countries faced massive challenge with Brexit, insisting Spain and Ireland would be working jointly to defend the interests and rights of citizens. The Taoiseach said that, like Ireland, Spain wanted an outcome "that is as close as possible as what we have now, we have trading relationships on a very strong basis." "I pointed out to the prime minister our unique circumstance in Ireland both in the links between Ireland and Britain over many years, the trading relationship of over a billion (euro), the common travel area and the fact that we have a unique circumstance in respect of Northern Ireland," he added. "So obviously we will keep in very close contact here." The Taoiseach expressed his concerns that the Good Friday agreement be maintained, saying that if the situation in the North "doesn't come together" and the Assembly has to trigger an election, then the election process would possibly be under way when the British prime minister triggers article 50. "That is where the real political challenges are," added Enda.